NEW! Standing almost 8 feet tall, this realistic looking, angry bear display will be the talk of your neighborhood! Project uses four of our heavy duty T-Hinges (#BHNG15) and two Eyescrews (#EYE3) available below. Heavy Duty Zinc Plated 4" T-Hinge, screws not included. 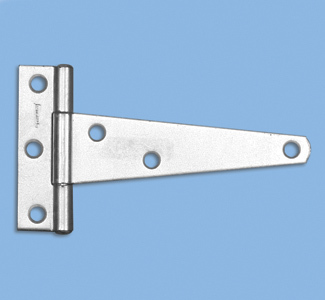 Left side of Hinge: 3/4" x 2-5/8"
Multi-Use Zinc Plated Eyescrews. .
Save 12-21% when you buy 3 or more!